N.J. Goes To Polls To Fill Vacant U.S. Senate Seat : The Two-Way Newark Mayor Cory Booker, a Democrat, is favored to win against his Republican rival, Steve Lonegan. 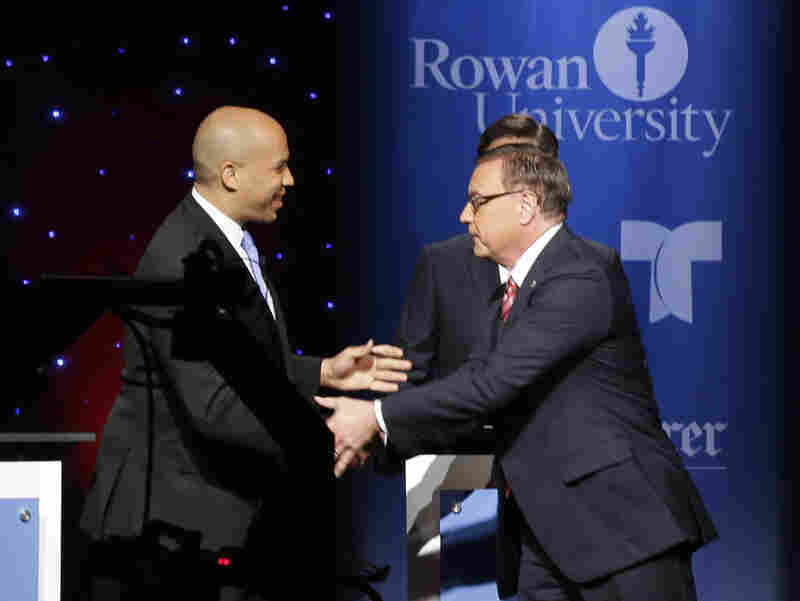 Democrat Cory Booker and Republican Steve Lonegan shake hands at the start of the final debate of their U.S. Senate campaign, last week at Rowan University in Glassboro, N.J.
New Jersey voters are choosing a new member of the U.S. Senate on Wednesday, in a special election pitting Newark Mayor Cory Booker against Steve Lonegan. Democrat Booker is favored in the polls to win the race to fill the vacancy left by the death of Frank Lautenberg in June. However, his Republican opponent, the former mayor of the northern New Jersey town of Bogota, has managed to close the gap a bit in the run-up to election day. "While Booker holds a double-digit lead in most polls, the charismatic Newark mayor has faced sustained Republican criticism that has exposed vulnerabilities that could hamper him should he seek even higher office someday. "Lonegan has hammered Booker on Newark's economic troubles, tax increases, and violent crime. The GOP also has assailed him over a 2008 statement that a drug dealer he called a friend was actually an 'archetype'; his G-rated Twitter exchanges with a Portland, Ore., stripper; his out-of-state fundraising trips; and a Washington Post interview where Booker, who talks about past girlfriends but prefers to keep his personal life private, said he 'loves' when people on Twitter say that he is gay and asked, 'so what does it matter if I am?' "
Despite Lonegan's backing from the billionaire Koch brothers, Booker holds a substantial advantage in fundraising, with $11.5 million compared with his rival's $1.4 million, according to The Wall Street Journal. The winner of the seat on Wednesday will succeed Gov. Chris Christie's interim appointee, Republican Jeff Chiesa, but will have to run again in 2014 to win a fresh six-year term.